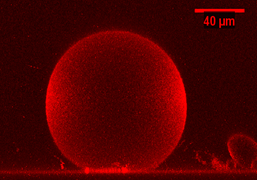 GUVs (Giant Unilamellar Vesicles) represent a convenient way to study membrane properties such as lipid bilayer composition, surface charge and membrane tension. They offer the possibility to study and visualize membrane processes due to their cell like size in absence of any constraint due to cell cytoskeleton. We develop a new axis of research using GUVs as the simplest approach to address permeabilization and fusion processes. We have just validated the GUVs model showing, for the first time, that different membrane perturbations (pores, vesicles and tubules) are associated to membrane electropermeabilization (Portet et al., Biophysical J. 2009). The open questions we want to address are to understand the effect of membrane composition and domains on such processes, and to determine the uptake process of molecules according to their size and charge (Portet et al., Soft Matter 2011). not only after as done until now and to identify membrane compositions and domains responsible for the different ways of molecules uptake. We are aware that GUVs studies have limitations. As reminder, large molecules such as DNA enter cells after a step of interaction with the plasma membrane. It may be not the case in pure lipid systems since other compounds (proteins, cytoskeleton) may be involved. As a direct consequence of membrane permeabilization is membrane fusion, another very new emerging aspect of our project concerns the use of GUVs as models to study the mechanisms of electrofusion, with an interest to their development as vehicles to deliver molecules into cells (Mauroy et al., Chem. Commun. 2012). The challenge is to know if these domains are pre-existing domains or electro-induced ones. 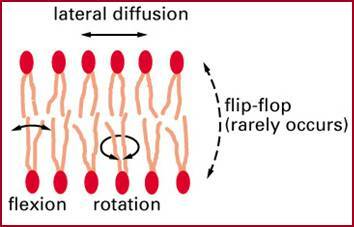 Our hypothesis is that transient alteration in membrane organization and dynamics, in particular flip-flop of lipids, may be involved in molecule uptake, DNA insertion and membrane deformation (curvatures). We are currently studying transverse and lateral mobility of lipids and proteins. Life-time of the interaction has also to be defined. Another key question about therapeutic molecules concerns their subsequent distribution into the cells. This is of high importance in the case of DNA since expression requires traffic, i.e. translocation of DNA across the membrane, migration through the cytoplasm and finally passage through the nuclear envelop. One of our hypotheses is that cytoskeleton may be involved as it is the case in fusion and permeabilization electro-mediated processes . 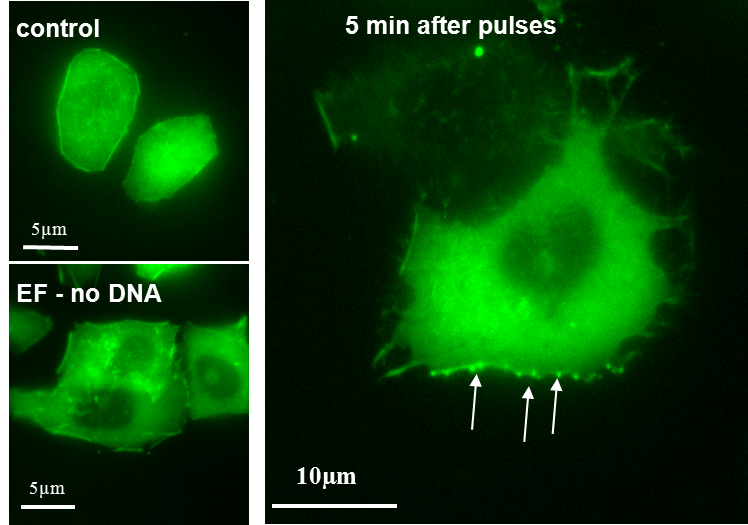 Our new results show actin polymerisation at the membrane sites DNA interacts with as shown here 5 minutes following pulse application (Rosazza et al., Mol. Ther. 2011). 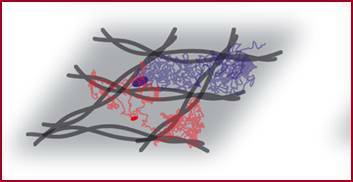 The challenging approach we are developing is to visualize the traffic of single molecule thanks to a collaboration with a group leader in that field (A. Zumbusch). New strategies, based on newest electric pulse generator technology will also be adapted to facilitate the entrance of DNA into the nucleus. All these experiments will give us some informations, on how permeabilization modifies the physical properties of biological membranes and will allow us to predict the way the different classes of molecules will be uptaken into the cells. Multicellular spheroids are 3D models of cells in culture able to mimic the behaviour of cells in a complex 3D organized system like a tissue. They allow studying more accurately, than isolated cells, what is happening in a model tissue environment, taking into account cell/cell interactions, extracellular matrix and accessibility of molecules. We develop a new axis of research using them as a model studying electropermeabilization processes. We just showed that they can be used as an original and convenient approach to study the mechanism of electropermeabilization in a tissue (Wasungu et al., Int J Pharmaceutics 2009, Chopinet et al., Int J Pharmaceutics 2012, Gibot et al., J Control Release 2013). We are now proposing to use competitive microscopy techniques (confocal and two-photon microscopies) to reach real time observations deep inside the living spheroids. 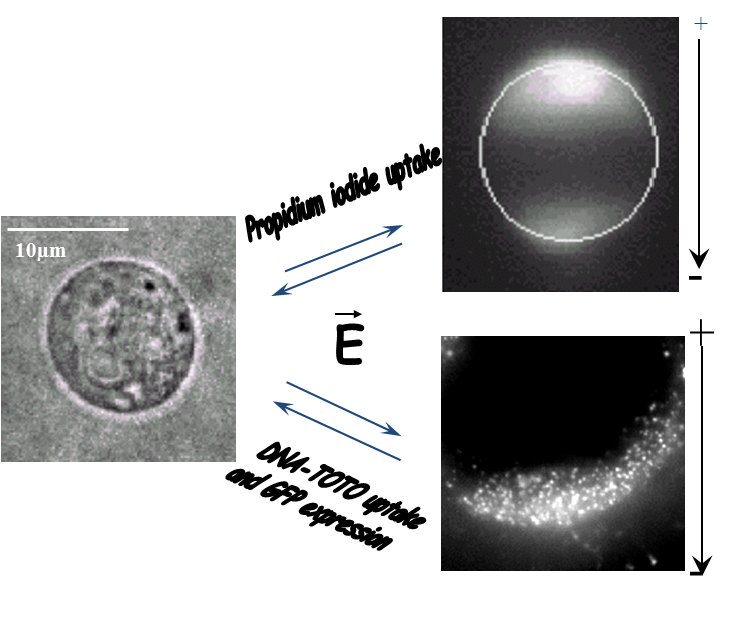 Our challenges are to identify the role of surface tension, cohesivity and compaction of spheroids in transport by using second harmonic generation, to directly visualize the extracellular matrix and therefore to study its role in molecules uptake. By doing such studies we will also be able to propose electric field conditions allowing the most efficient biodistribution of the molecules in the spheroids and optimum cell plasma membrane permeabilization for their uptake.